Casting for Recovery focuses on enhancing the quality of life of women with breast cancer through a unique program that combines breast cancer education. Breast cancer survivors – sign up now! 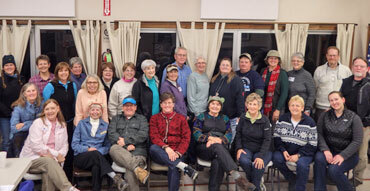 The March outing took about 20 TWFFers to the Paluxy River in Glen Rose, hosted by Sharon Leissner with her side-kick, Kay Jackson. For those of you who may not know, the Paluxy River is best known for its dinosaur tracks that are imbedded in the limestone river bottom that runs through the State Park. This part of Texas was a swampy beach mil-lions of years ago, and fossil hunters come to the area to look for treasures. 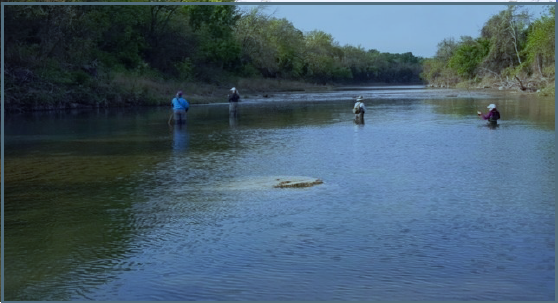 This year’s outing on the Guadalupe was held the weekend of January 27-29, 2017 and it was a big success thanks to all who attended! It was a great kick-off to the 2017 TWFF outings season. We had a solid turnout of about 27 members, guests, and new members. The weather was a bit chilly on Friday afternoon, but Saturday was nice and Sunday was a bluebird day! Several members arrived a day or more in advance of the outing to scout out the area and had some time to settle in. We had a nice contingent of those with campers, who stayed near each other, which provided a lot of fun and fellowship around the campfire at the end of each day. Sharon Leissner and Lori McElroy were among the campers and served as hosts to this year’s event. Check out more photos from this outing in our Photo Gallery! Another great adventure under our belt! Even with very cold temperatures and the threat of bad weather that actually did result in some sleet on Sunday morning and into Monday, a fun time was had by all. I think we definitely proved that there are no “fair weather” fishers in this club. Those of us who brought warm gloves and gear were very thankful for it early in the morning and late in the evening. Every visit to the fabulous waters of the Lower Mountain Fork River of Southern Oklahoma seems better than the previous one. Our group of novice to expert women fly fishers caught plenty of fish despite the cold weather and showed up in force to try their hand at fishing this great river. The leaves were changing and the beautiful and colorful surroundings were enjoyed by all. 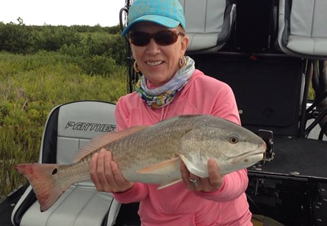 This year’s saltwater outing in Port Aransas was held about a month earlier than previous years. We again had our headquarters and the Executive Keys condos, right on the beach. This is a wonderful location and great for this type of group activity. We had about 30 members and their significant others attend. Great turnout! We were all anxiously watching the weather and tracking Tropical Storm Dolly through the Gulf. She made landfall in Mexico, just south of Brownsville, a couple days before the outing. 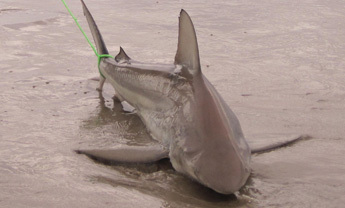 Unfortunately she brought with her lots of seaweed and rip tides which put a damper on surf fishing. Undeterred, we setup our beach tent anyway and had wonderful casting instruction Saturday morning from Diane Blair and Sheila Anderson. Urban angling is a not-to-be-missed experience I recommend everyone add to their bucket list. The solitude we feel when we are on the water with rod ready to cast to that soft spot just beyond the ever protective weeds that defend the bass’s domain, can be suddenly interrupted by the wail of sirens as emergency vehicles scream to the location of an early morning call. A conversation with your friends as you paddle from the launch site to where you’ll begin your drift gets drowned out by the train whistle sounding at each intersection of traffic it approaches and the rumbling vibrations created from the nearness of it. You are reminded quite often that you have not left the city, rather you seem to be directly in the midst of chaos as you adapt to these stimuli. Twenty-three intrepid TWFF members brought their kayaks, bobcats, campers, and great attitudes to beautiful Tyler State Park, located in the piney woods, two miles north of Interstate 20 near Tyler, Texas. A few of us camped in the beautiful park or took advantage of the park’s screened shelters. Note: if we have another outing here, book your campsite, cabin, or shelter EARLY. Another Well if you missed the “Crock Pot Cook Off” in Kingsland you missed too much fun. I think I laughed the entire week-end. The winner of the cook off was Beverly Gordon with her GREAT Mexican dish. The setting at Rio Vista Resort was just perfect on Lake LBJ, comfortable accommodations and room to sit and chat (and LAUGH). Pat ran the business meeting at the Mullet Mixer and we met several new members, Janet and Emery Baca, Mary Lieberman, Maryruth Monahan, Julie Jordan, Stephanie Sobotik, and Beverly Gordon.